Soothing sounds, beautiful views, diverse wildlife, and only a week to take it all in? Costa Rica is unlike any place I’ve ever been. Upon my arrival, my mind was racing with ideas of how I was going to get the very most out of my trip. As an Environmental Studies Major at University of California Santa Cruz, I’m typically curious about different ecosystems and eager to interact with wildlife wherever I am in the world. The two-hour drive from San Jose Airport gave me plenty of time to take in the scenery of the mountainous jungle and ask my driver Oscar any and all questions I had about Costa Rica. I learned everything from the economic/environmental effects of Costa Rica’s biggest industry (Palm Oil) to what species of tree leaves I should use to make henna-like face paint (Teak). Excited to learn more about my home for the week, I did some research and found a nearby animal rescue center that I could volunteer at, Kids Saving The Rainforest. I was excited to hear from locals that this sanctuary is one of the most renowned in all of Costa Rica! I immediately contacted the president and the Operational Director of KSTR, Jennifer and Chip. They responded promptly and were very helpful. To my surprise, my younger brothers, Jake and Max, wanted to join me in this adventure. KSTR sent a taxi to pick us up early Monday morning. The drive through the palm tree forest was scenic and bumpy. There were water buffalo hauling carts of the palm fruits and goats crossing constantly. We arrived at KSTR/Blue Banyan Inn around 9am and started off with a tour to become familiar with the site and what our mission would be for the day. As soon as the tour came to an end our work began. Our mentor gave us rubber gloves and brushes and led us to a large cage where we would clean and design a new habitat for the Kinkajous. These small mammals are adorable yet vicious as they’re nocturnal and don’t like to be bothered during the daytime. The zookeeper and another KSTR staff member handled these animals regularly and made it look easy. Once the Kinkajous were out of their cage Jake, Max and I cut zip ties, removed all the old branches, took to ground and got to scrubbing. Before we knew it the habitat went from looking like a 3 star residence at best to 5 stars, complete with clean walls/floors and fresh branches strategically placed for the Kinkajous climbing enjoyment. 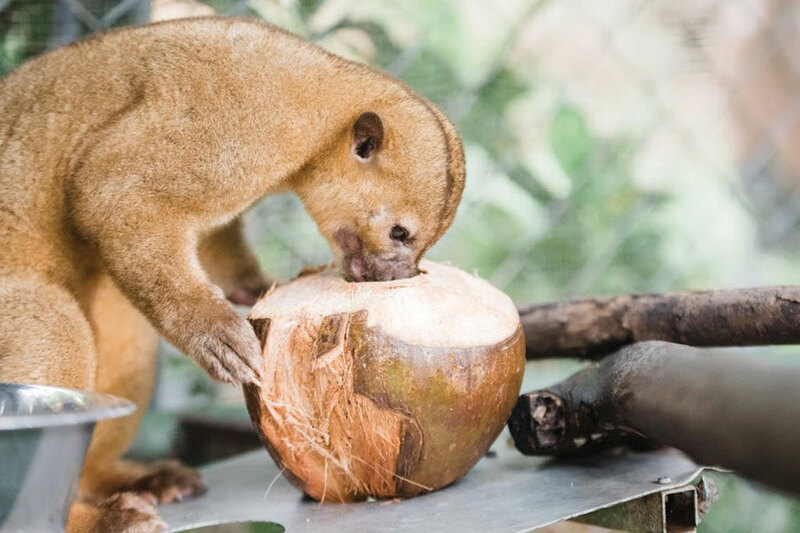 It was important that we made their new habitat slightly different than the last since these animals need some variation in their lives to mimic the constantly changing and growing rainforest. It was getting humid and I was getting tired…lunch couldn’t have come at a better time! KSTR provided us with a delicious typical Costa Rican meal of beans and rice, chicken, salad, and plenty of beverages. We spent some time refueling and chatting it up with Chip and the other volunteer siblings who were coincidentally visiting from the Bay Area. I was particularly impressed by their involvement with KSTR and the video chatting they do with other kids from all over, spreading the word about the cause. I’m hoping to join forces with them once we’re all back in the Bay. After finishing lunch and taking a quick dip in the pool, it was time for us to feed the animals. Some went to the kitchen to chop up fruits and vegetables. The other half of us went with the sanctuary manager to find and capture giant Golden Orb Spiders (which is way more fun than it sounds). Once we had about ten spiders in a bucket we were ready to go. We went from cage to cage filling each animals bowl and feeding them spiders by hand. In the midst of it all it began to rain and we were all laughing, dripping wet, and having the best time ever. We proceeded to clean up our messes then and walked back to the main lodge where we would finish up around 4pm. Costa Rica will take me a lifetime to explore to my full satisfaction. In just one day on July 11 Kids Saving The Rainforest Sanctuary & Rescue Center gave me my first real opportunity to do more than just admire and understand nature through a textbook or a tour. I felt like I played a vital role in an ecosystem. It was rewarding to see the difference that our single day of volunteering made. This was a pivotal experience for me in that it helped me to discover myself. I now know for a fact that environmentalism is my calling and my niche. I’m very grateful for KSTR and all of the work they continue to do to inspire people to preserve and protect this small but important part of the world. I hope to spread this mentality on a global scale by sharing my experience and educating others about the ways to make a positive change through ecotourism. It’s important to remember that we affect nature as much as it affects us. Visit www.kstr.org for more information. Maddie Abene, now a senior at UCSC,, is pursuing her passion of environmentalism working with Tesla in the San Francisco Bay area. She continues to be passionate about the environment, our earth and improving the quality of living for all creatures.